In last week´s TETF index update, we discussed the Dow Jones Industrial Average (DOW) hitting all-time highs and FAANG (Facebook, Amazon Apple, Netflix, and Alphabet – formerly Google) stocks continuing to soar. What a difference one week makes! We are halfway into October and volatility has returned. In a time like this, we like to step back and assess the landscape of the tools we have available as portfolio allocators. This week, we’ll focus on the alternative space as both stocks and bonds took a hit in last week’s volatility spike. Before we do, let’s revisit broad performance of the asset classes covered last week to show how much has truly changed in a short period of time! Equities were down across the board in correlation with treasuries. The five FAANG stocks have lost 10.53% last week alone. 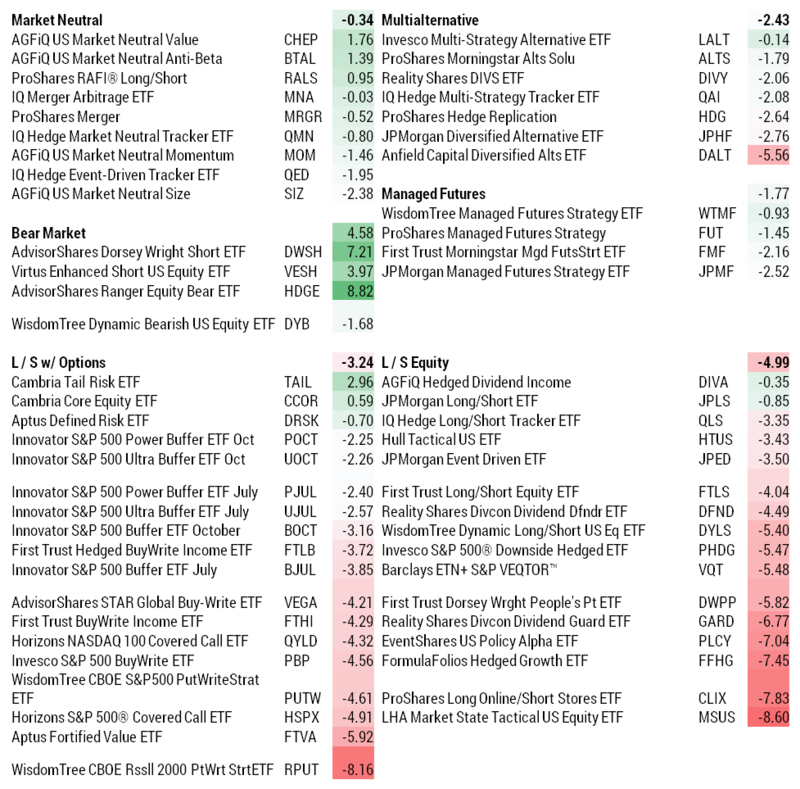 For the purpose of this exercise, we excluded commodity, VIX, leveraged, allocation, and tactical funds; in other words we analyzed those investments built on a more structural diversification approach. Provides exposure to the spread between low and high beta stocks in a market neutral & sector neutral approach. See our original paper on BTAL. Long and short exposure to equity factors (value, quality, and momentum) with a dynamic market beta. Many of these positions have been the unloved child of one’s portfolio, causing pain and reducing overall portfolio returns. The last two weeks were a reminder of why alternatives are necessary in your portfolio and why digging under the hood is more important than ever! 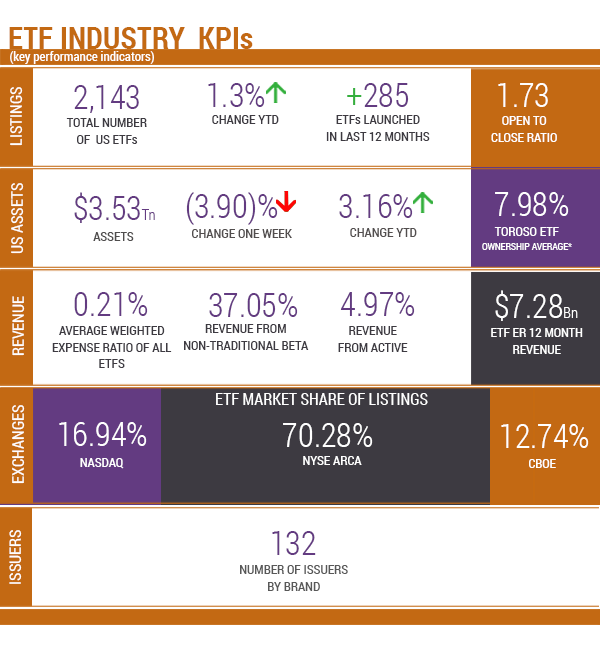 Understanding these ETFs that go up when the markets go down is another great example of an innovation growth factor for the ETF ecosystem. 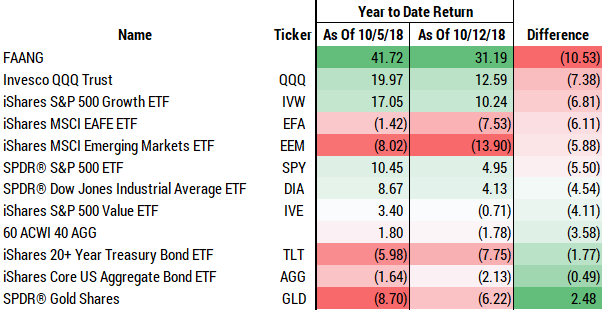 Returns as of October 15, 2018. As of October 15, 2018. Source: Morningstar Direct.